What are the principles of makeup eyeliner? Apply eyeliner on the eyelash or slightly outside;The lower lash line should be tattooed on the inside of the root of the eyelash.It’s natural and appropriate. To small palpebral cleft person, do not advocate commonly eyeliner will look line grain is too close to eyelash of palpebral edge edge, can make after otherwise grain more shrink, affect aesthetic feeling. 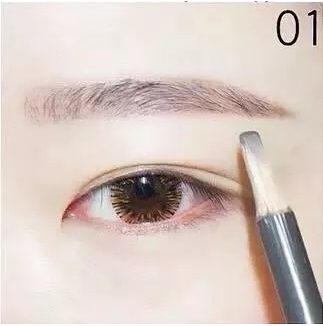 Lipped eyeliner should use black dye, wencha follow “rather narrow not wide, rather shallow not deep, moderate” principle. The inner side of upper and lower eyeliner should be slightly thinner, while the outer edge should be thicker. Generally speaking, the width and thickness of upper and lower eyeliner should be controlled at 7:3.It must be adjusted flexibly according to the factors such as eye shape, age, occupation, temperament, hobby, etc.Requirements on the eye: puncture method is the dot method, other steps with the eyebrow tattoo.The eyelash line on grain is general in on eyelash root line first a fine line, if need to widen, go toward eyelash outside undertake.Under the eyelash line when the root of the lower eyelash first tattoo a thin line, if need to be widened to the inner surface of the eyelash white areas. According to the Asian tattooing network, the upper canthus is slightly tapered, and the middle part of the canthus gradually widened and thickened to the lateral canthus, which is more youthful and lively.Lower lash line should be thin, slightly wider at the end of the eye is better.Ask the patient to close their eyes, which can reduce pain and terror, and remind them not to approach the eyes with their hands or make sudden movements with their head, so as to avoid hurting the eyes.When grain eyeliner to see tiny blood bead is advisable, wipe with cotton ball do not drop color can.After the operation point antibiotic eye liquid, antibiotic eye cream, 1 week after the scab off, and then according to the situation to fill once.